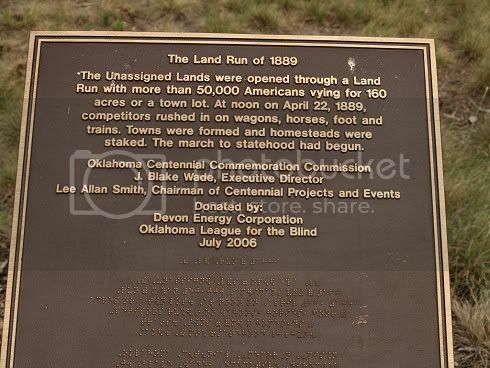 Although I've used various images of this great facility in other posts on an ad hoc basis, I've not done a complete article on the Oklahoma Land Run Monument, until now. Contained here are images which were taken on September 7, 2007, and July 29, 2008, both photo-shoots being on cloudy mornings ... not the best conditions (no "blue" sky) but good enough and possibly even better for dramatic effect ... 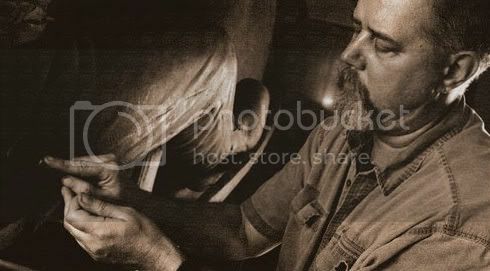 I'm not an artist, so I can't say for sure. Located at the southern end of the Bricktown Canal, the original plan was for 46 1/2 sculptures depicting the April 22, 1889 Land Run to be located on both sides of the canal, as shown in the illustration at the top of this article. 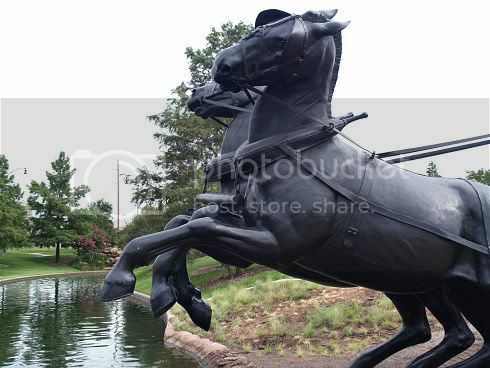 What the "1/2" represents, I don't know, but that's what the sculptor's website seems to indicate. Nineteen are presently done. 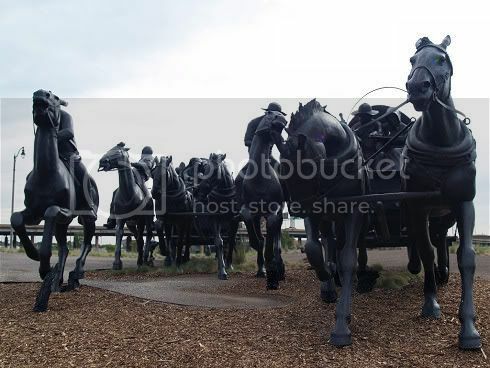 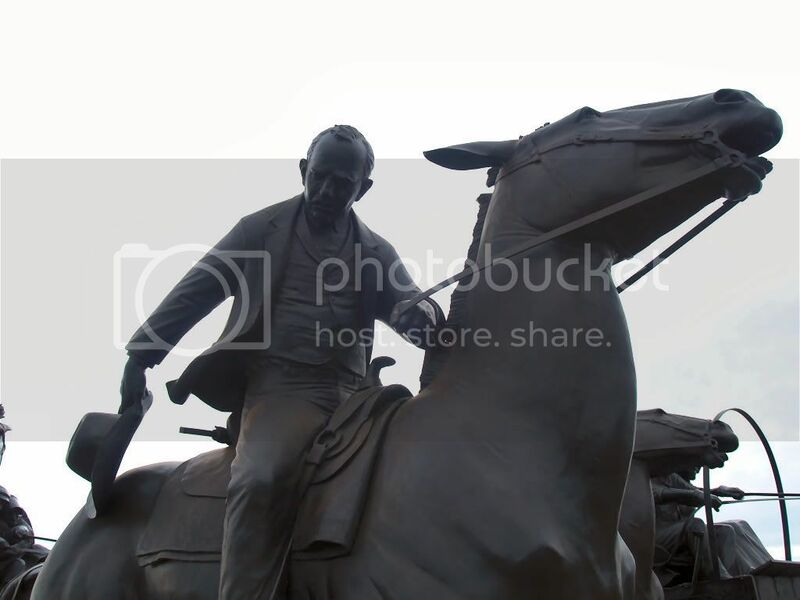 This City of Oklahoma City news item states the number of sculptures to be 45. 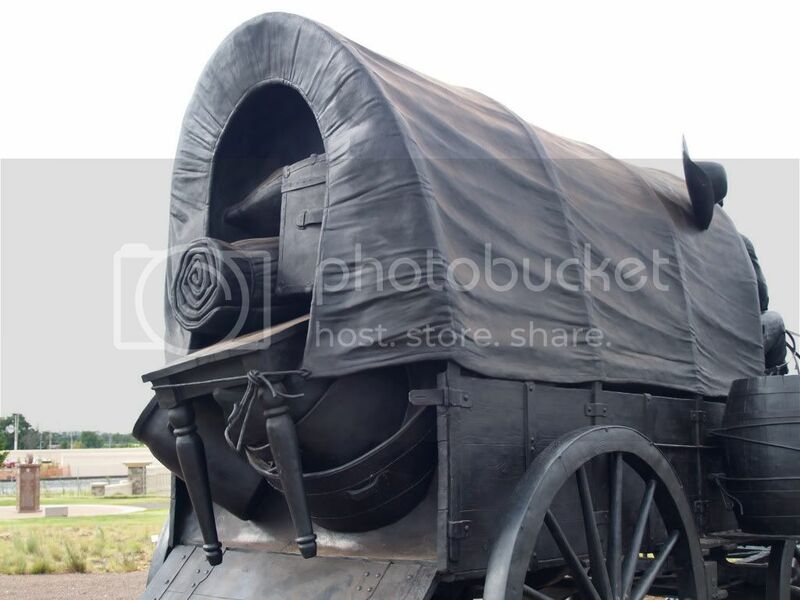 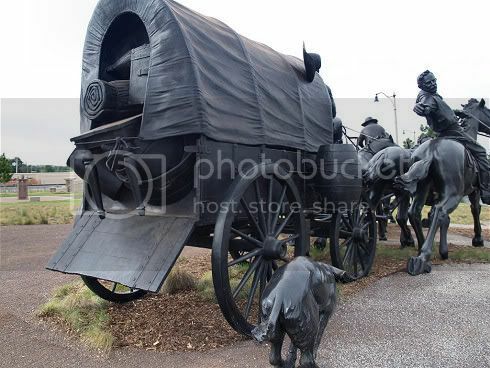 The complete assembly was to include 38 people, 34 horses, 3 wagons, 1 buggy, 1 sulky, 1 dog, 1 rabbit and 1 cannon. 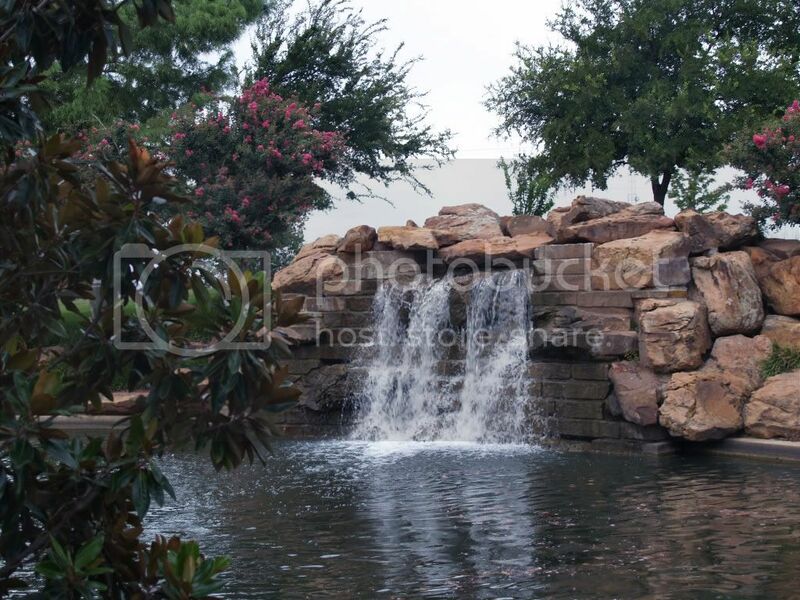 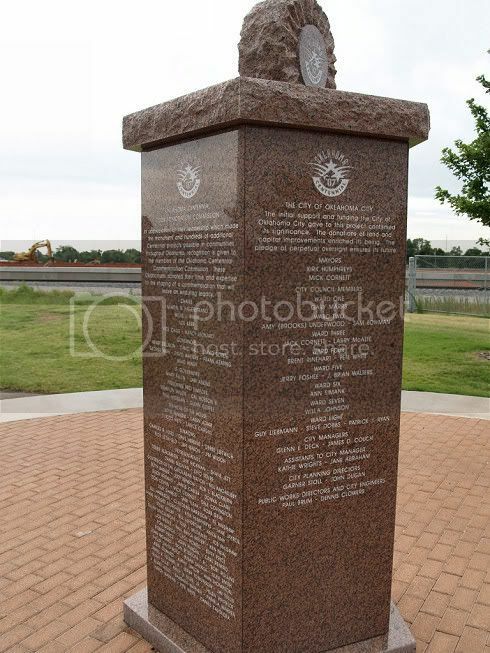 The monument physical area is 365 feet long by 36 feet wide and is over 15 feet high. 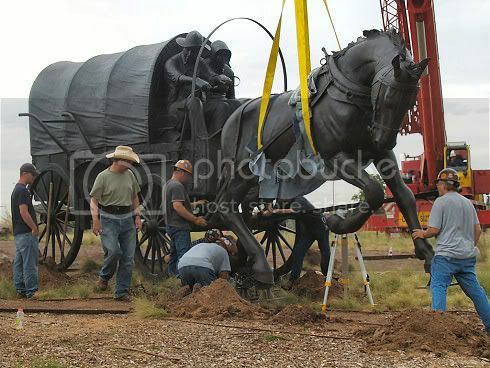 When done, it is said that the monument will be one of if not the largest collection of bronze sculptures in the world. 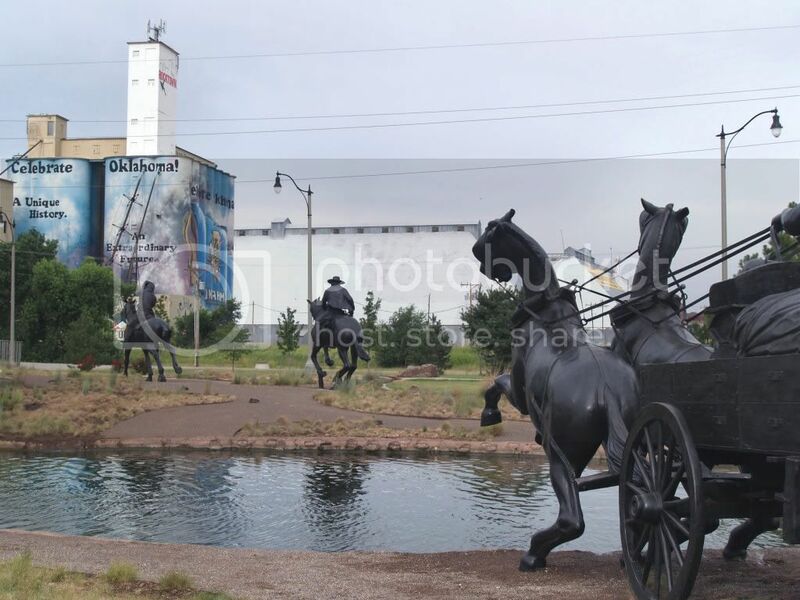 Stanley Draper Jr. envisions larger-than-life monuments such as the Gateway Arch in St. Louis when he ponders a group of "heroic-sized" statues depicting the Land Run of 1889 in Oklahoma City. 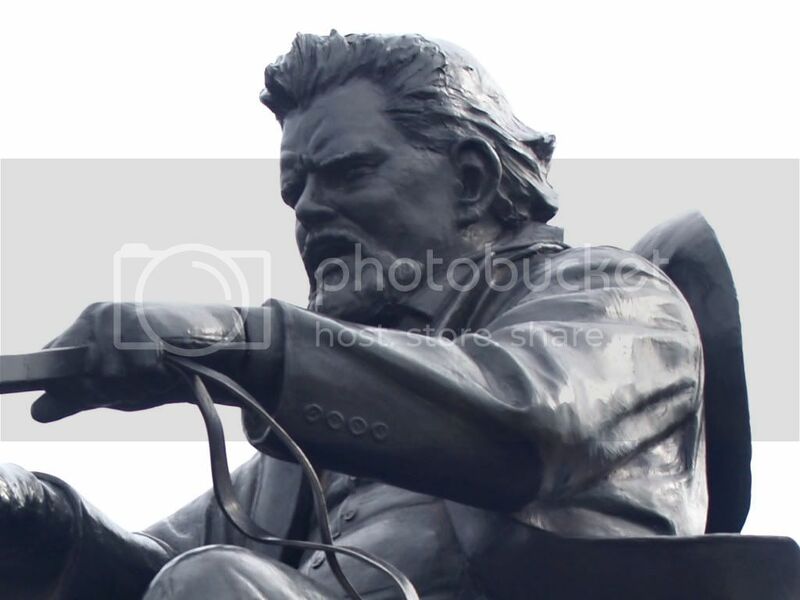 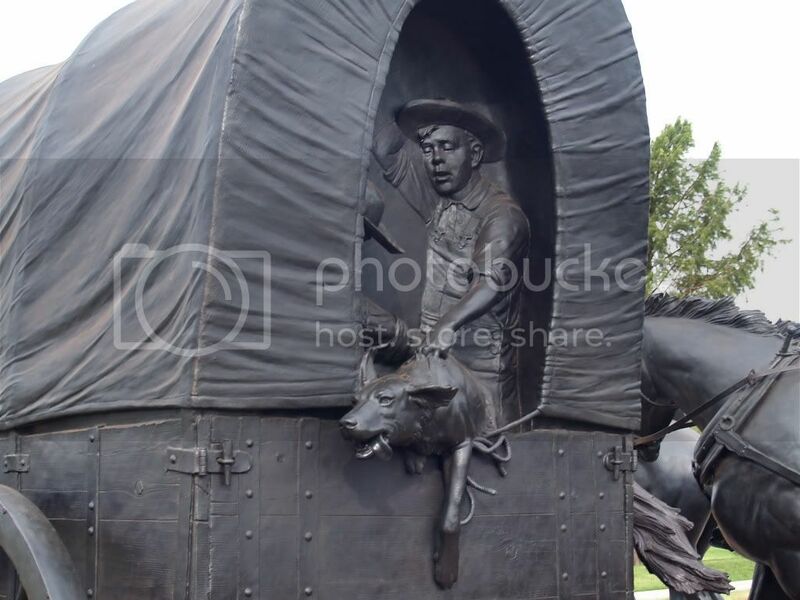 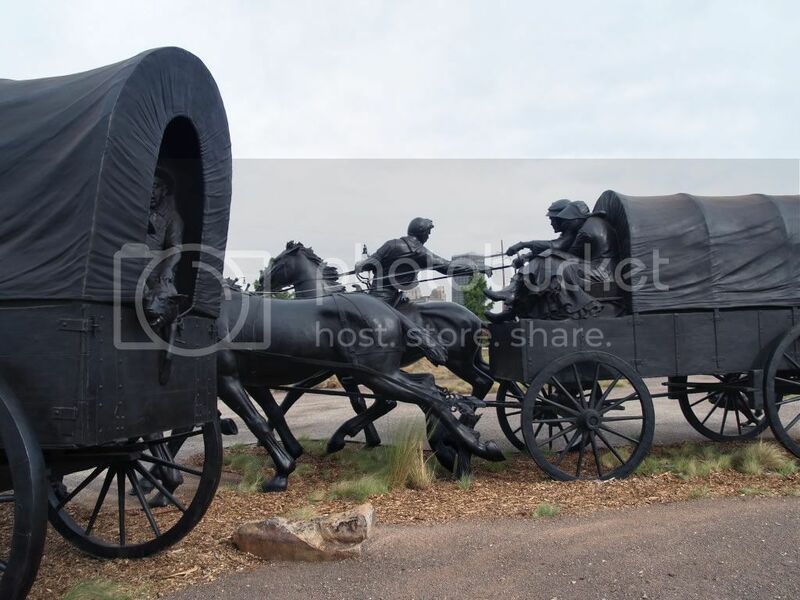 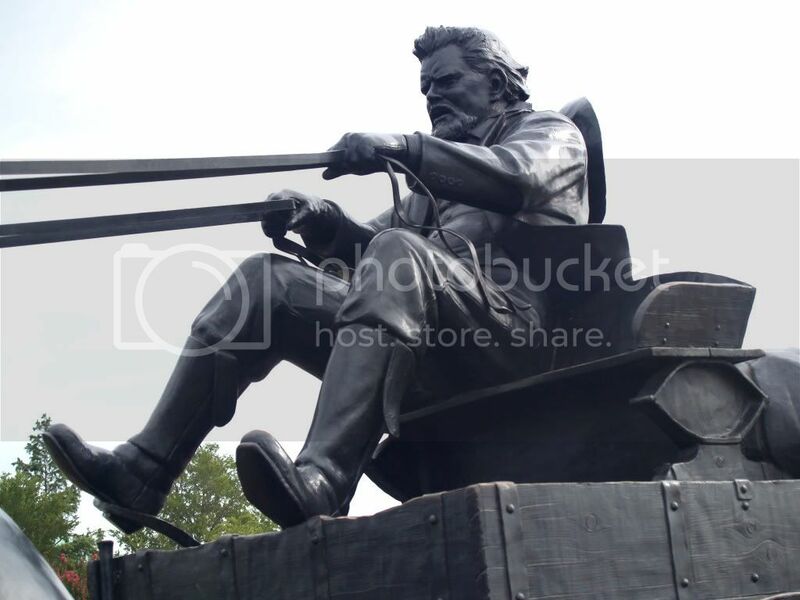 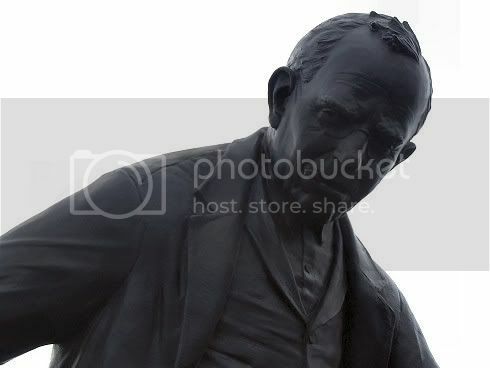 His original dream was to have the display of hardy pioneers, their wagons, buggies and thundering horses in place last year for the Centennial celebration and U.S. Olympic Festival '89. 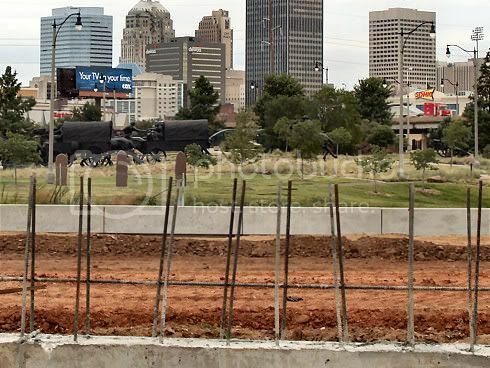 Those projects proved to be enough to tackle, but now that the city has caught its collective breath, Draper said it could be ready for its next major undertaking.
. . . and that's where the snippet leaves off. 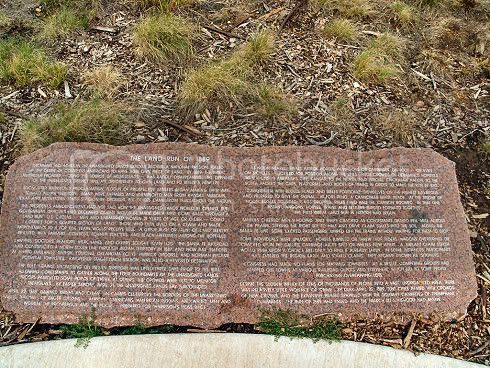 As it developed, the project became embraced by the Oklahoma Centennial Commission and has been funded by Oklahoma City, Oklahoma, and the federal governments. 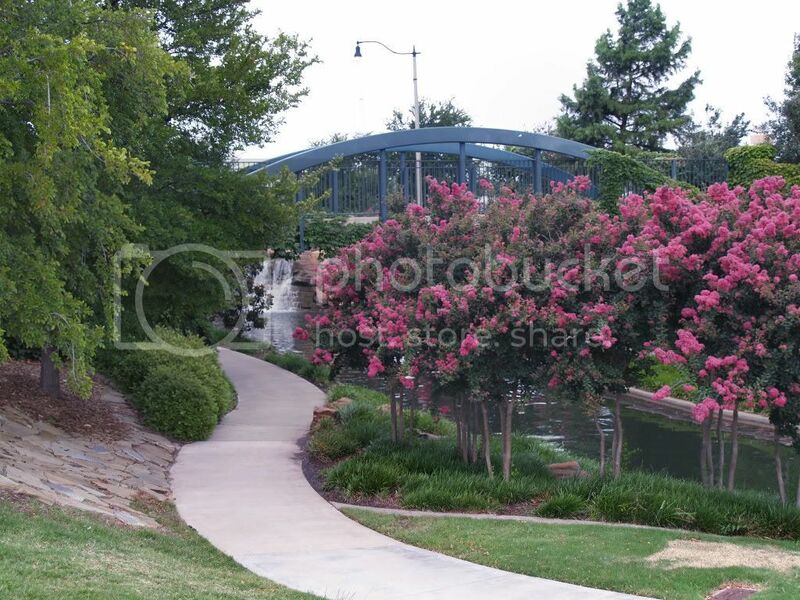 Its location was proposed to be either (a) near the State Capitol, or (b) in Lower Bricktown, by and over the Bricktown Canal. 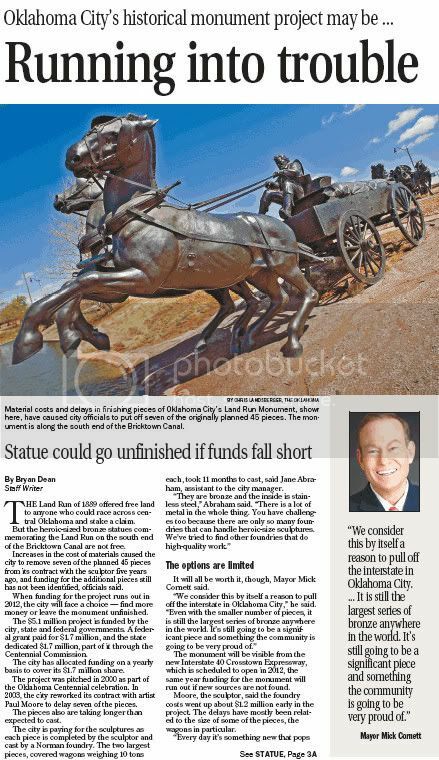 The January 19, 2000 Oklahoman described the potential project. 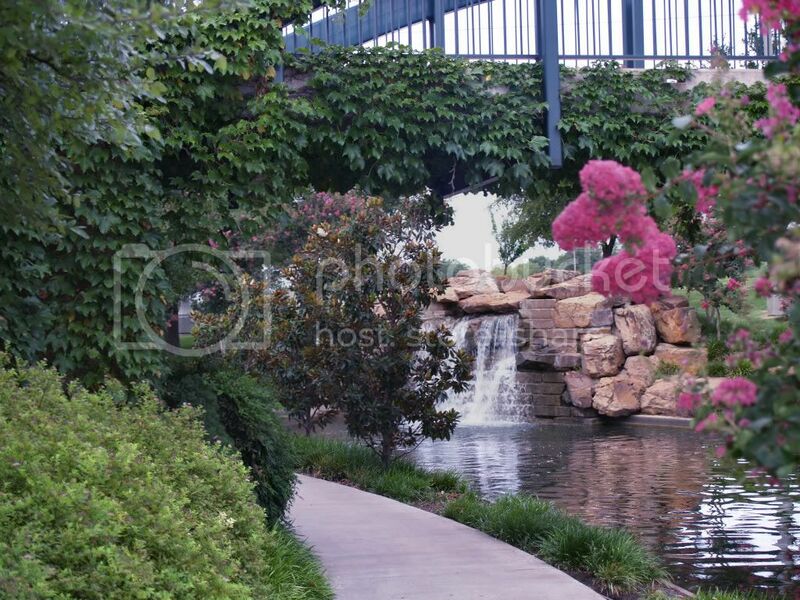 A Norman artist, Paul Moore, is already working on the designs. 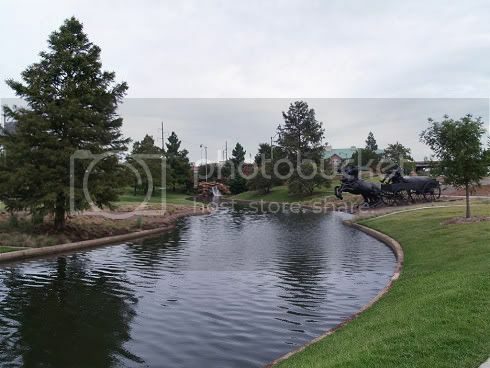 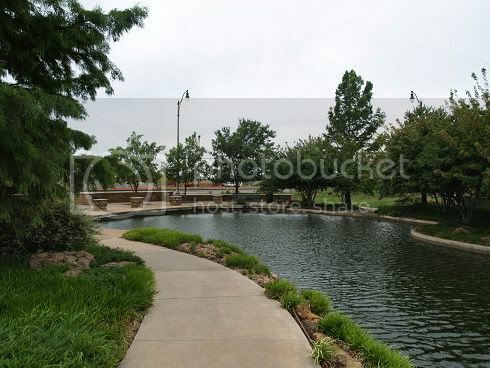 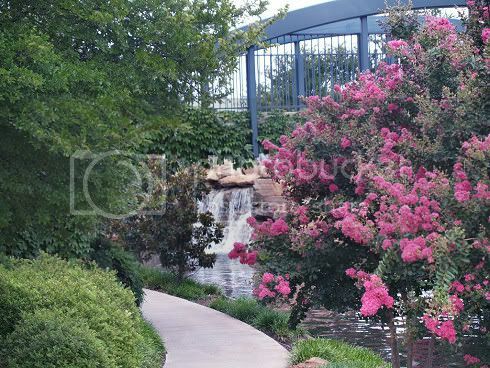 The southern end of the Bricktown Canal, which presently offers nothing but open spaces, would be dominated by the sculptures. In a June 14, 2002 Oklahoman article, Steve Lackmeyer wrote that the project was being billed as, "Oklahoma City's answer to the Gateway Arch in St. Louis." 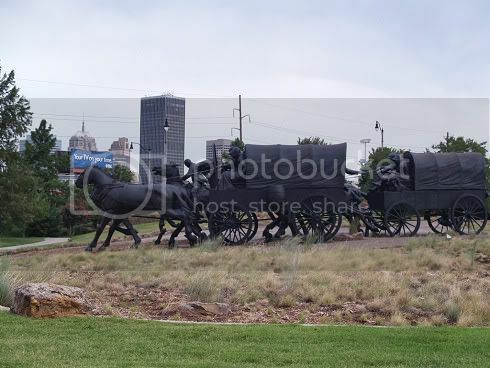 But, as it is, St. Louis' Gateway Arch is strikingly visible while Oklahoma City's Land Run Monument is strikingly not. 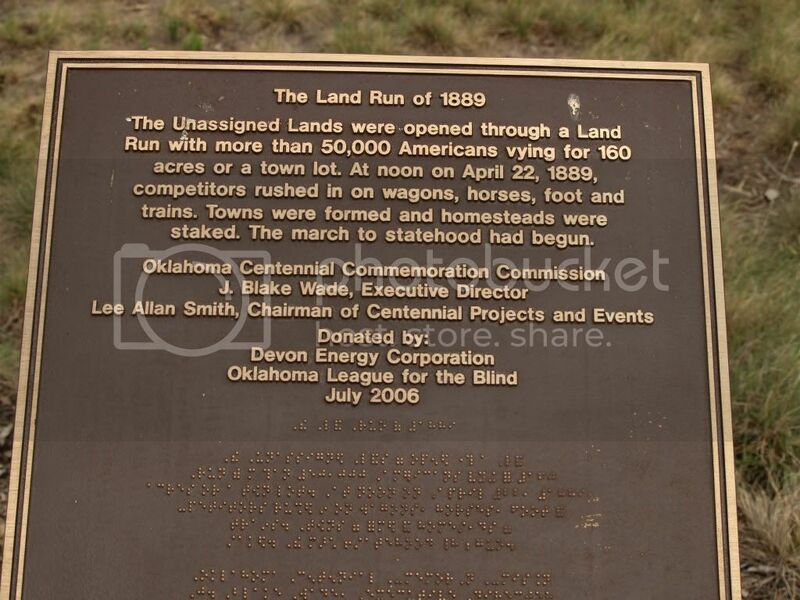 If one has no clue about the existence and/or location of the Land Run Monument, it is essentially invisible. 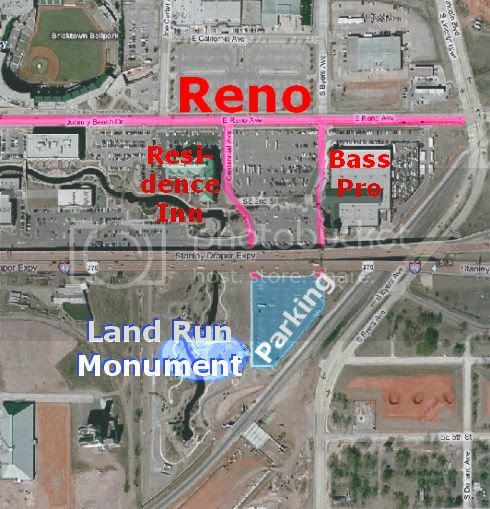 It cannot be seen from Reno, the nearest roadway -- certainly not through the parking lots of Bass Pro or the Marriott Residents Inn, and not from current-day I-40 unless one knows exactly where to look. Its profile does not rise high into the sky — its profile is low and near the ground, and, as far as Doug Dawg can tell, it receives strikingly little publicity for a project as grand as it was touted to be, and is, and is becoming. That may change with the relocation of the I-40 Crosstown realignment project. 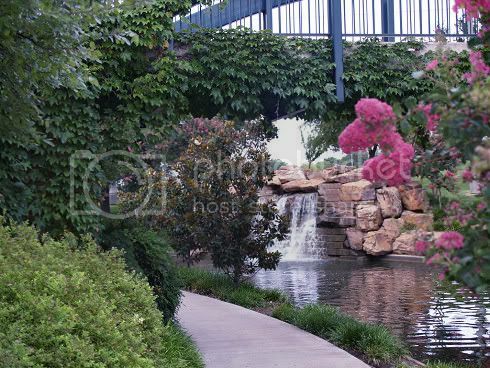 The realignment takes I-40 through the south side of Lower Bricktown, just south of the Land Run Monument, as shown in this April 6, 2003 Oklahoman drawing, color enhanced by me for focus. In real life, this greater "visibility" can begin to be seen. 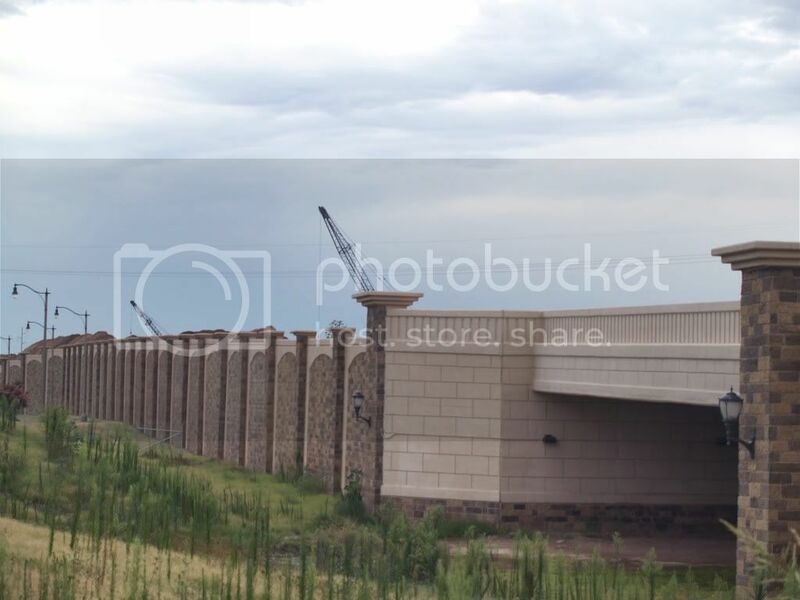 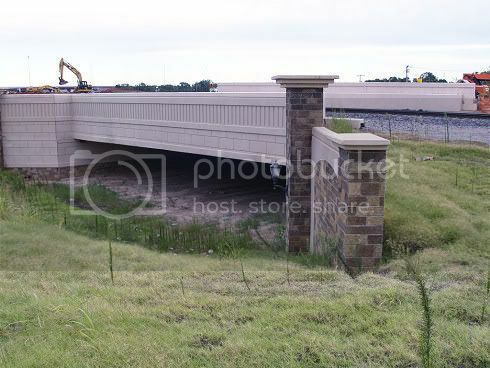 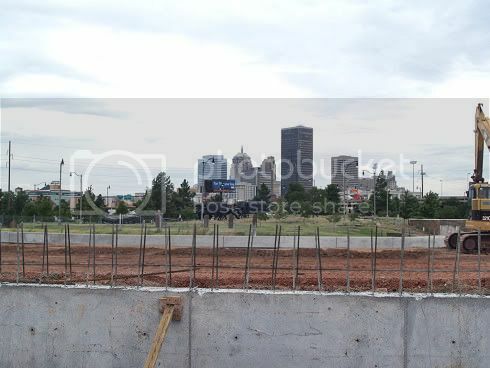 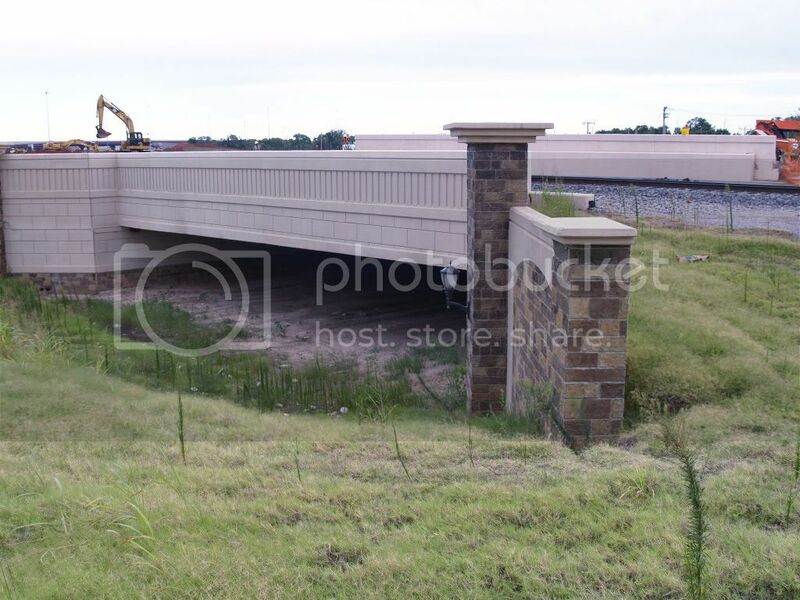 The photograph below, taken July 29, 2008, from the south side of the in-progress construction on the Crosstown relocation, gives a glimpse of what drivers will see when the new highway becomes reality. Paul Moore, Sculptor, and the Monument's Description. 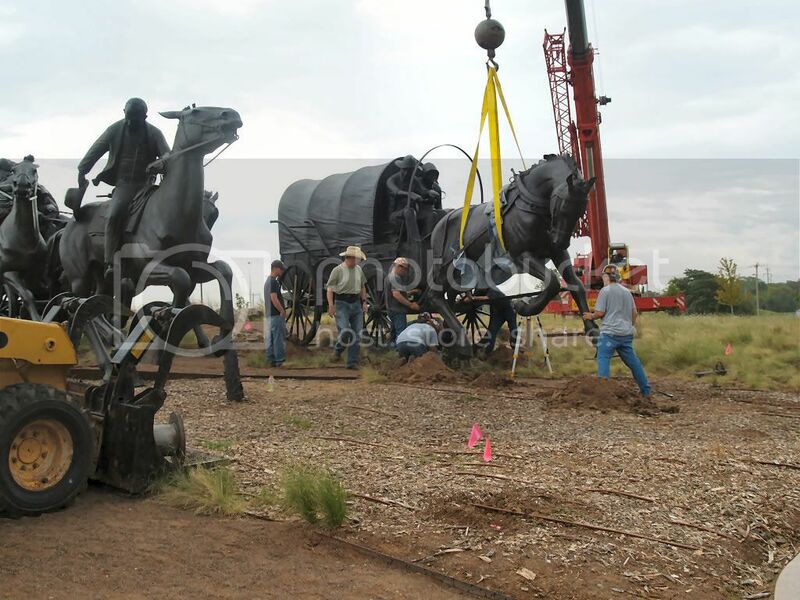 ALL pieces in this massive project are the creation of Paul Moore of Norman. 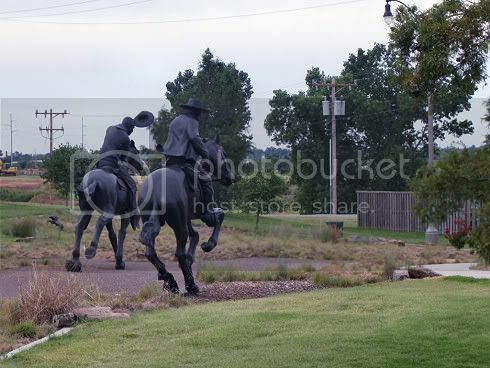 In addition to having his own studio in Norman, Moore is as Artist in Residence and Professor of Figurative Sculpture at the University of Oklahoma and several of his artistic works adorn the university and other locations throughout the state -- click here for a good look at several others. 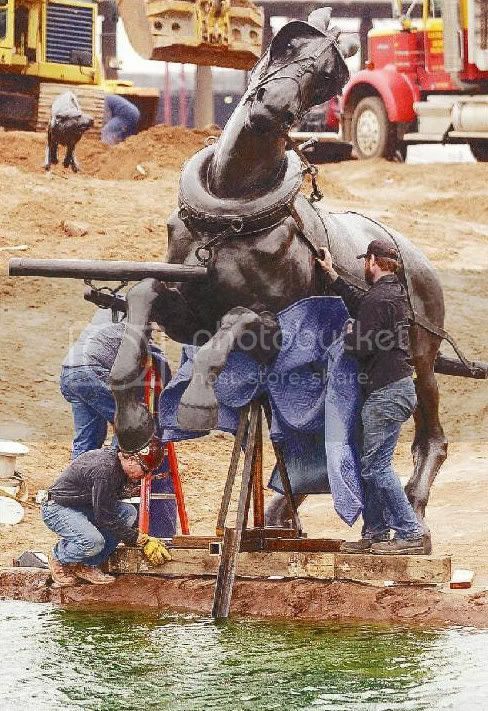 All sculptures are very oversized (about 150% larger than real), and all are created by renowned sculptor Paul Moore, above. 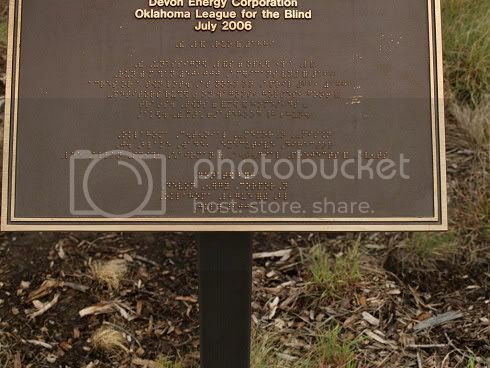 Moore was born in Oklahoma City in 1957 and is a member of the Creek (Muscogee) Nation, Sweet Potato Clan, even though his white great-grandfather participated in the Land Run. 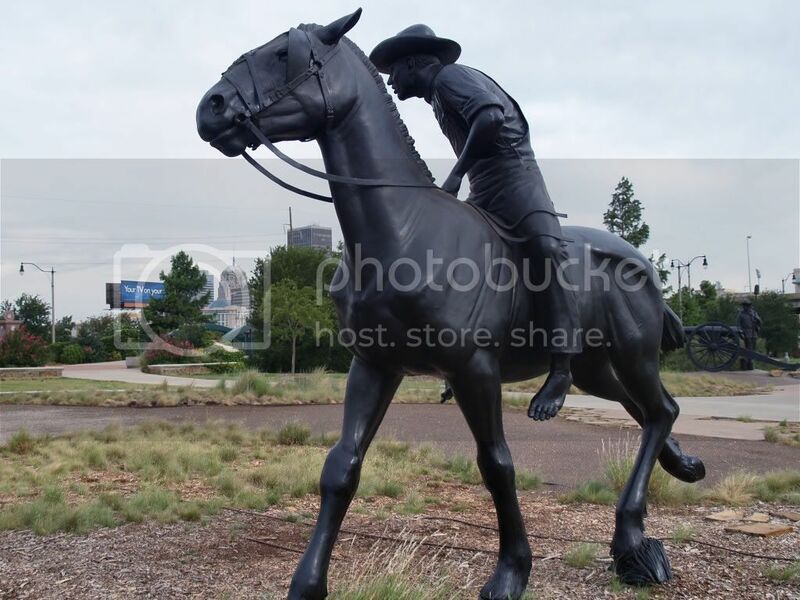 For much much more about the artist, click here. 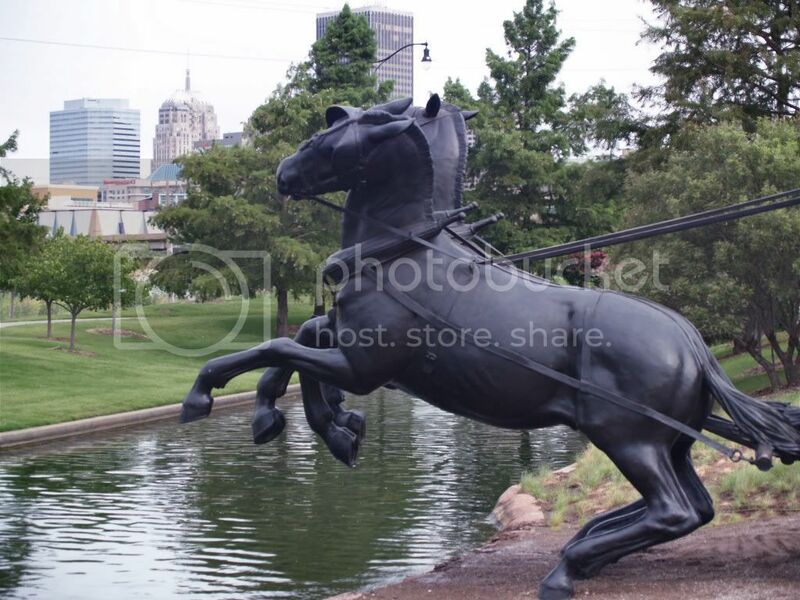 Doug Dawg is no art expert but he knows what he likes when he sees it! Paul Moore's sculptures that are in place as this article is written strike me as some of the most grandiose and gorgeous sculptures that this Okie's eyes have ever seen. You say, "Why should I believe you?" 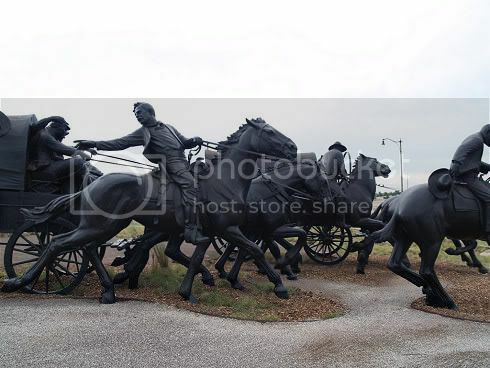 Fair enough! 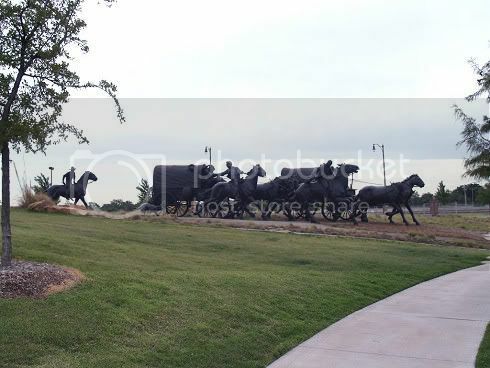 Have a look for yourself, below (or, better, in person) and then render your own opinion. 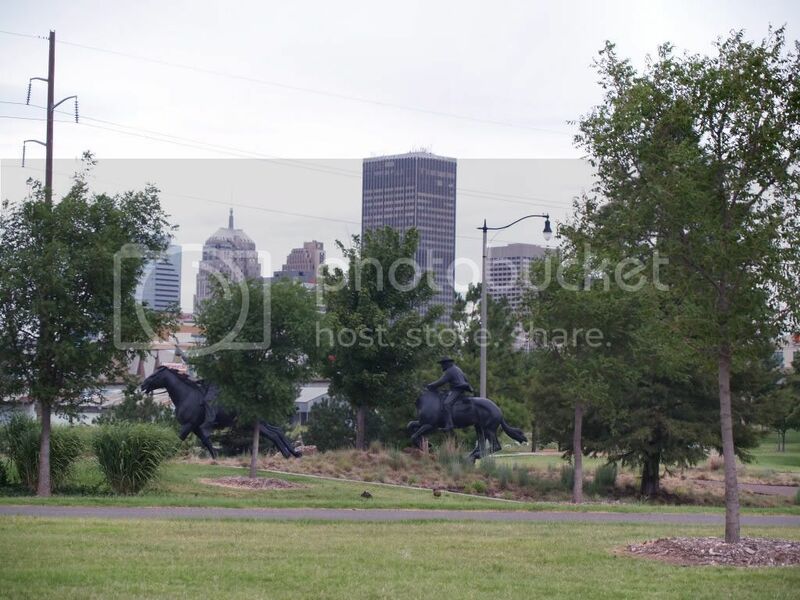 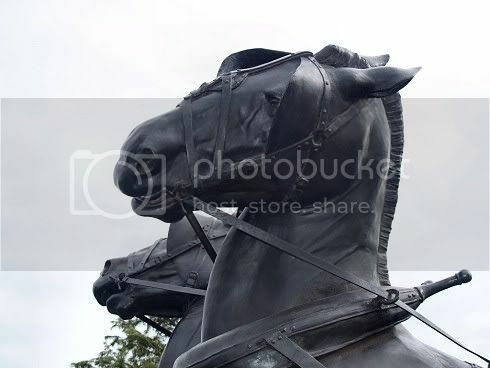 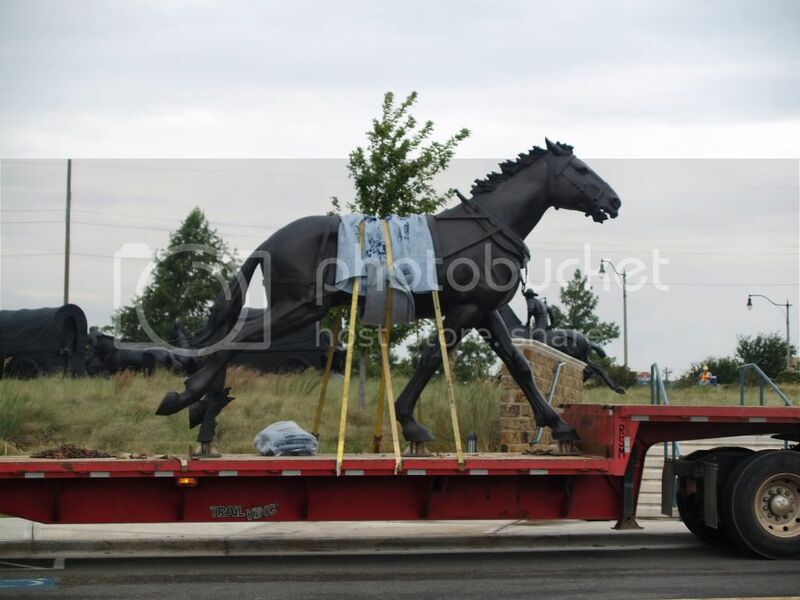 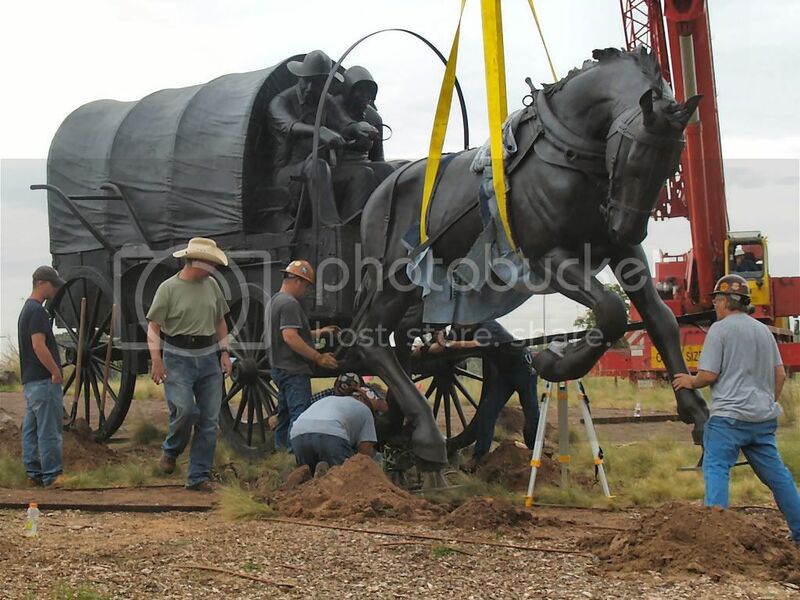 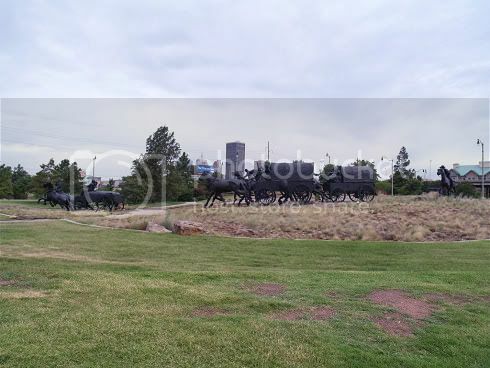 The first sculptures were placed in the Land Run Monument area in April 2003, including a pair of horses, each weighing 2,800-pounds, rearing back. The horses' hooves are each about a foot wide, if that helps visualize the size of these gorgeous beasts. 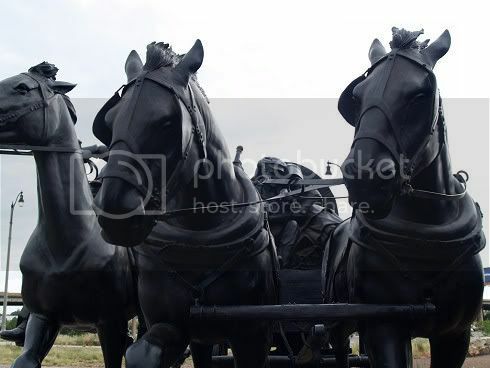 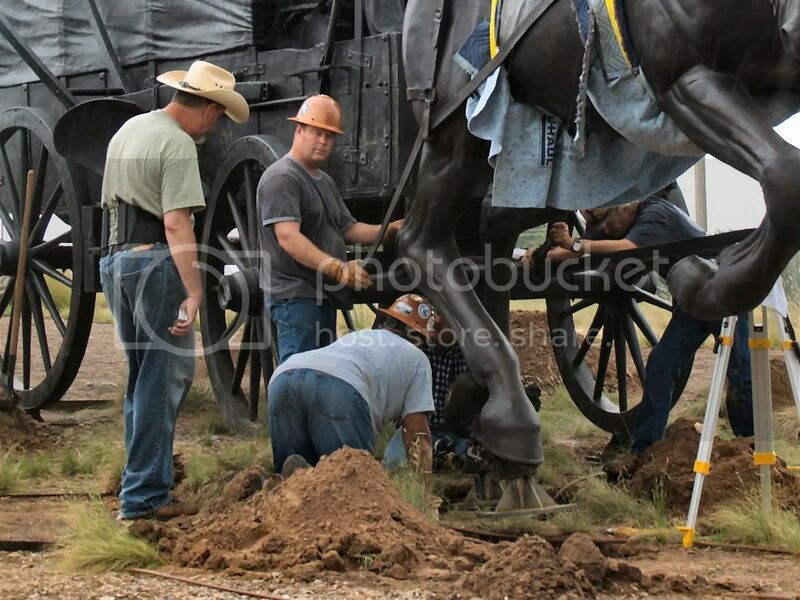 The horses pull a 8,500 pound wagon and driver. 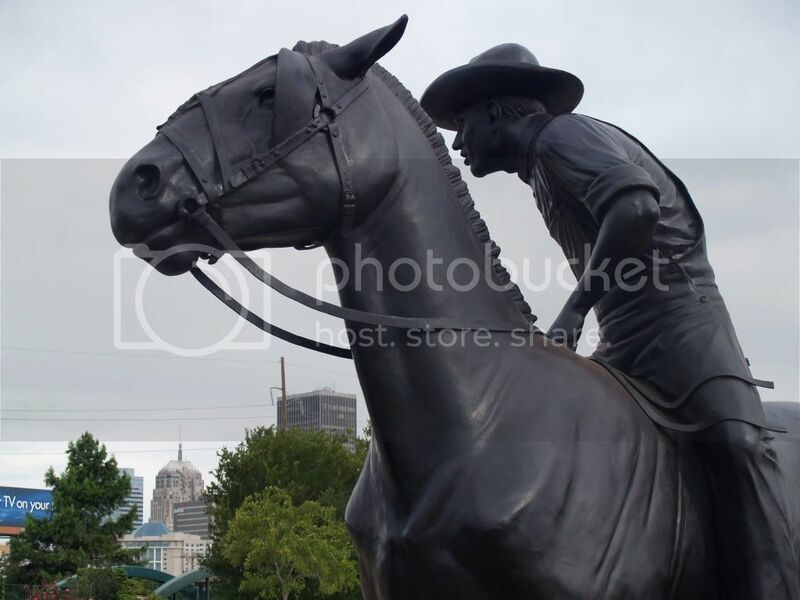 According to an April 22, 2003, Journal Record article, Moore also sculpted the statue of Johnny Bench in front of the SBC Bricktown Ballpark and other pieces featured around the state, such as the 35-foot Chisholm Trail sculpture in Duncan and the "Seed Sower" at the University of Oklahoma campus in Norman. 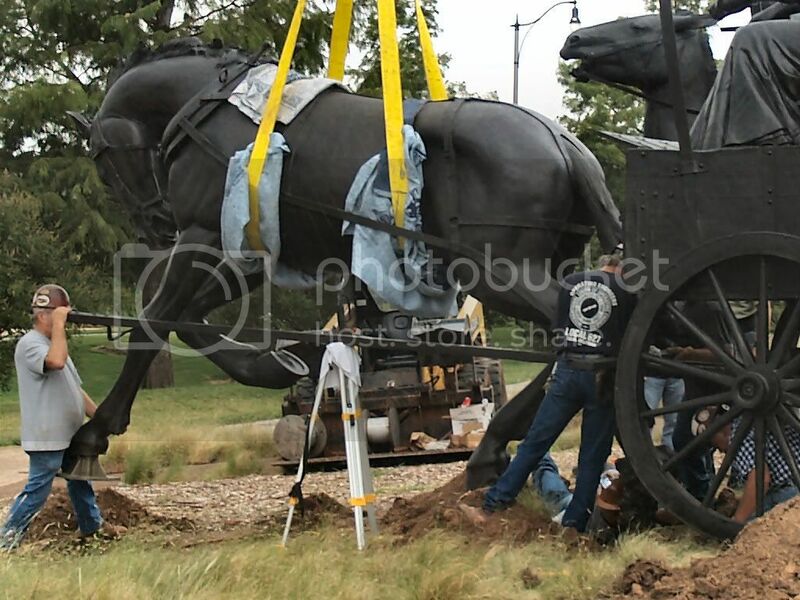 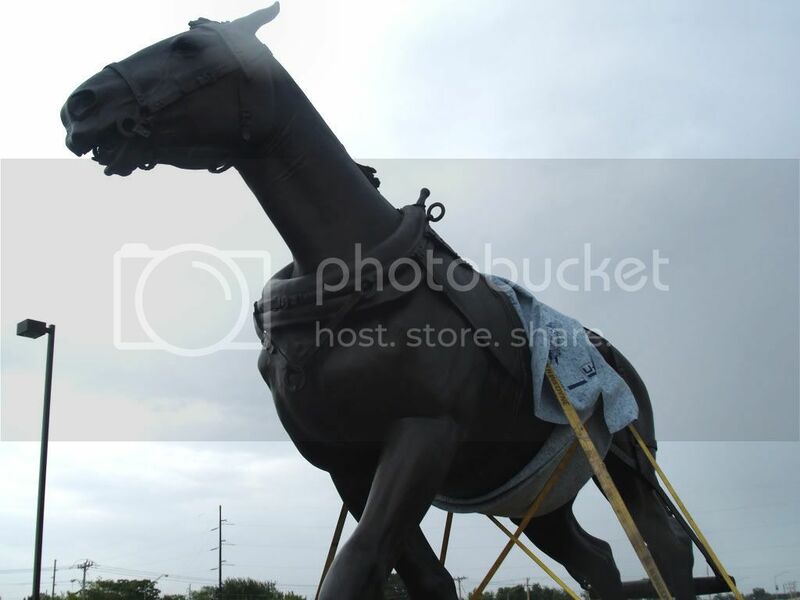 The latest, a horse and rider, was put in place just a few days ago. Will the plan of 45-47 sculptures be attained? 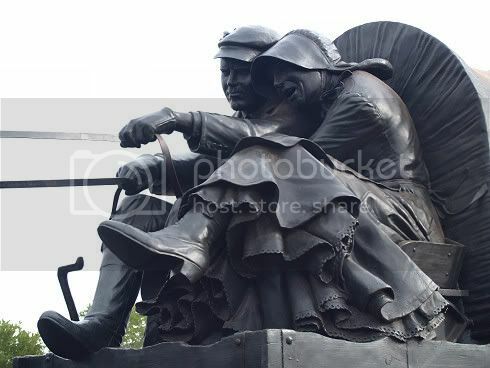 Who can say, but if that goal is not reached, the monument's 19 sculptures already in place are drop-dead-gorgeous, without more! July 29, 2008. 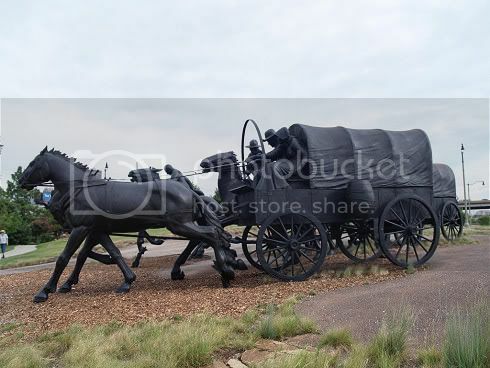 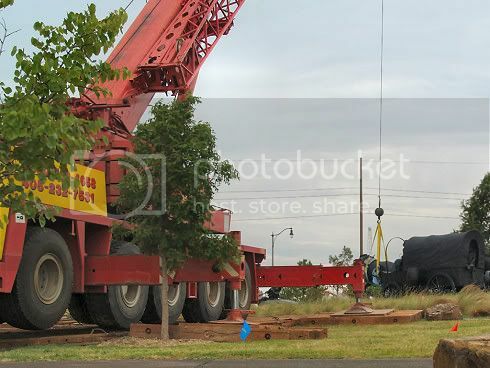 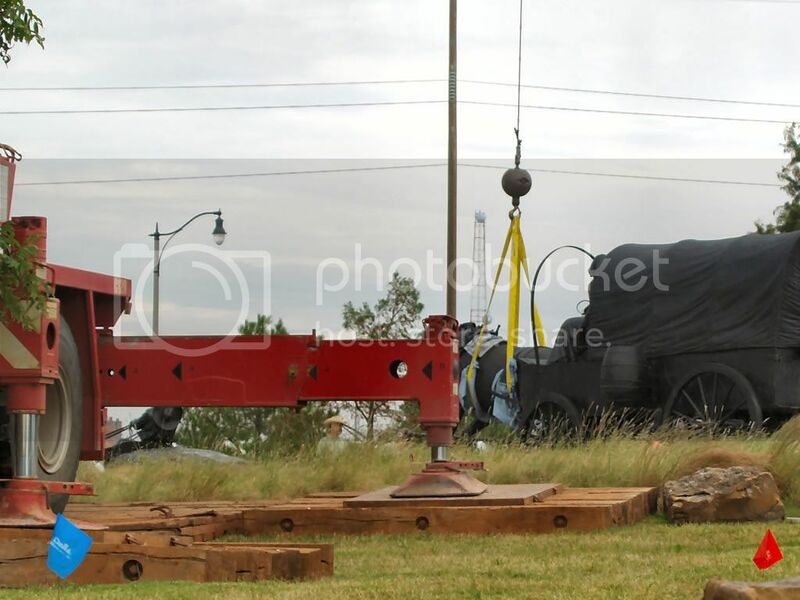 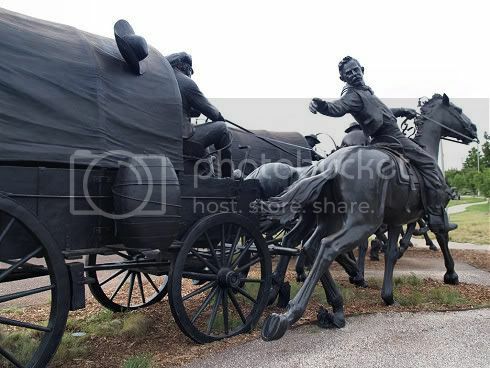 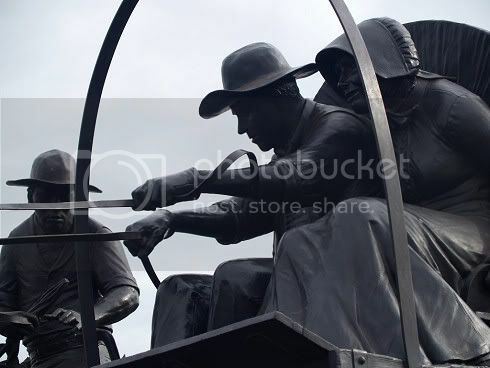 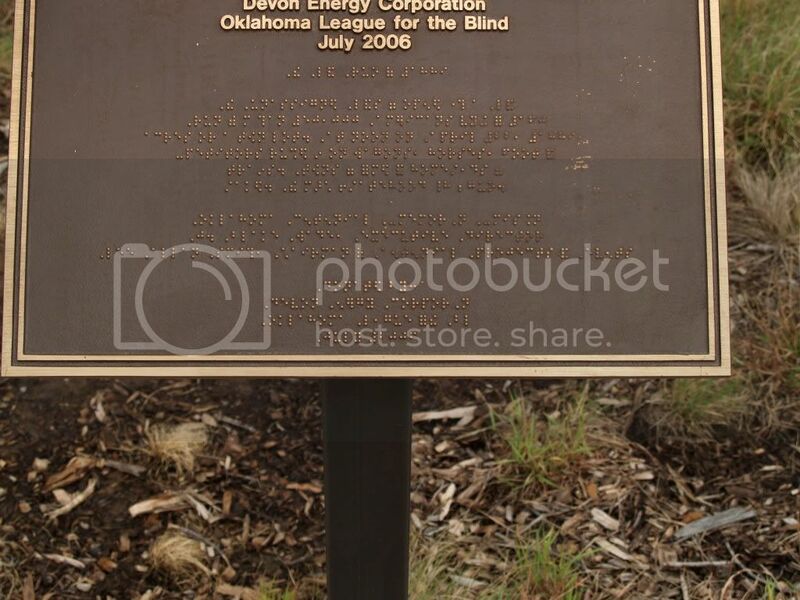 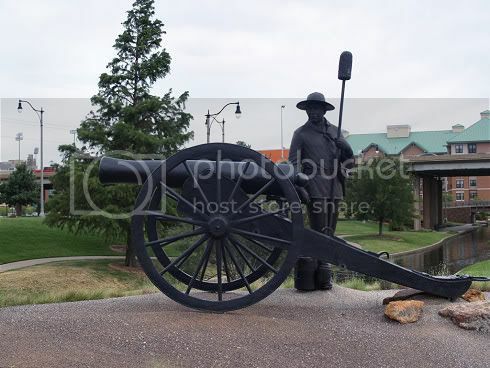 Now, have a look at my photo-shoot of the Oklahoma Land Run Monument on July 29, 2008, 10 months later than the above. 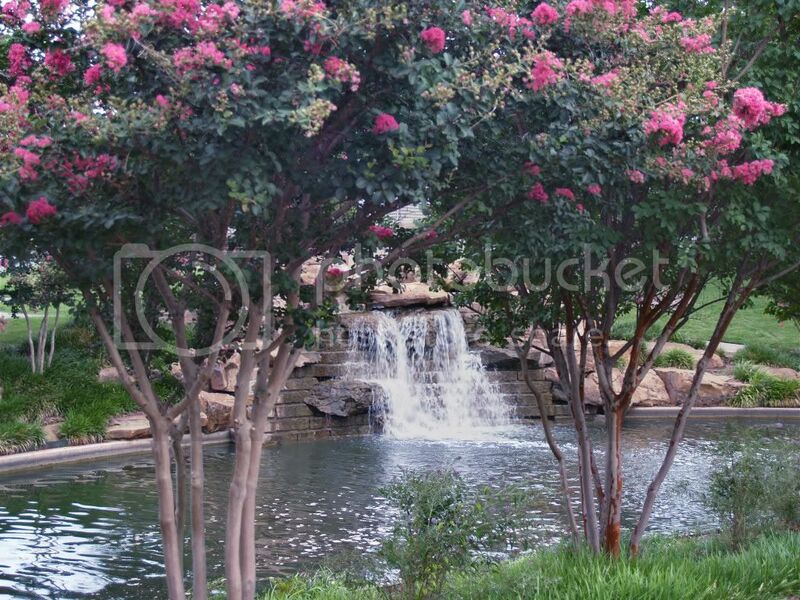 To see a larger image of each which appear below, click the image and a larger image (1024 x 768 px in most cases) will open in a separate window (IE Explorer) or tab (Firefox). 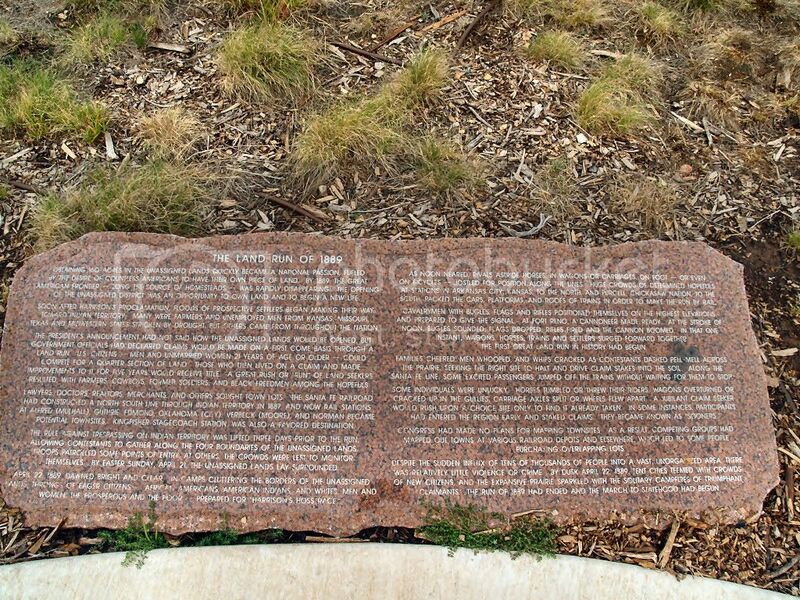 Many other plaques and markers are present than I've shown. maybe its blast signaled the start of the run. 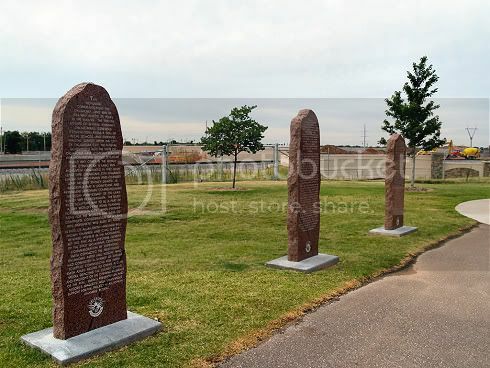 These pieces are somewhat separated and north of the others. for a view south of the new highway, but looking north. 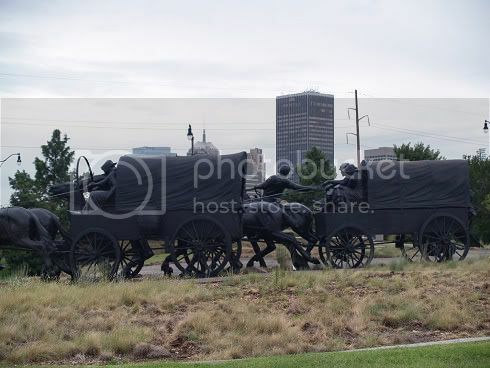 Look closely and you'll see the monument in the background. 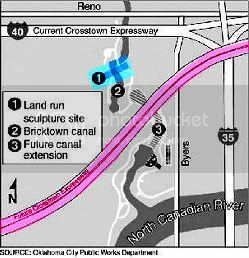 The mayor expressed hope that funding to complete the full project would be found when the time comes to do so. Mayor Cornett noted, "Even with the smaller number of pieces, it is still the largest series of bronze anywhere in the world." 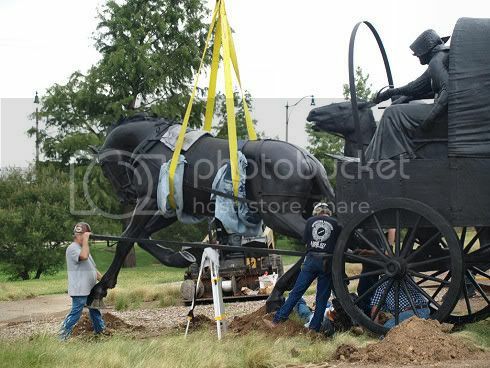 He added, "I think that eventually we will see every piece done." 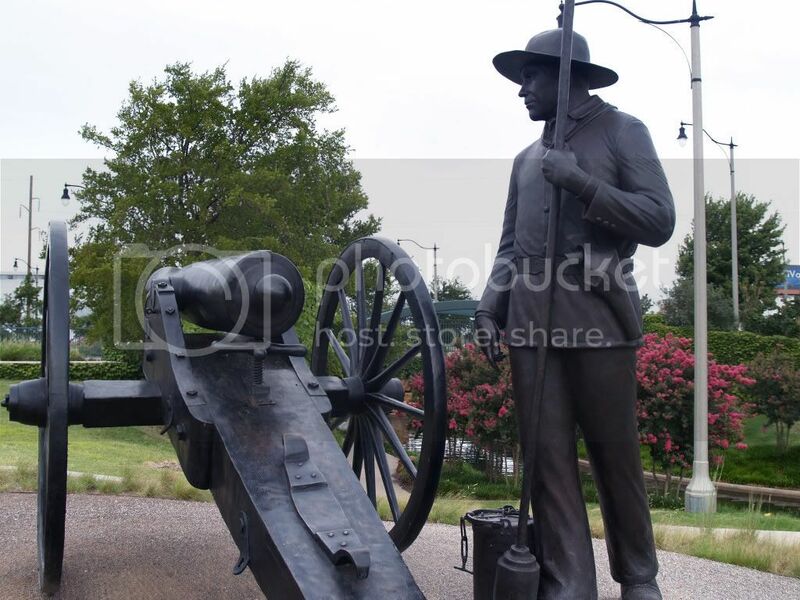 Doug Dawg surely hopes that Mayor Mick is right. 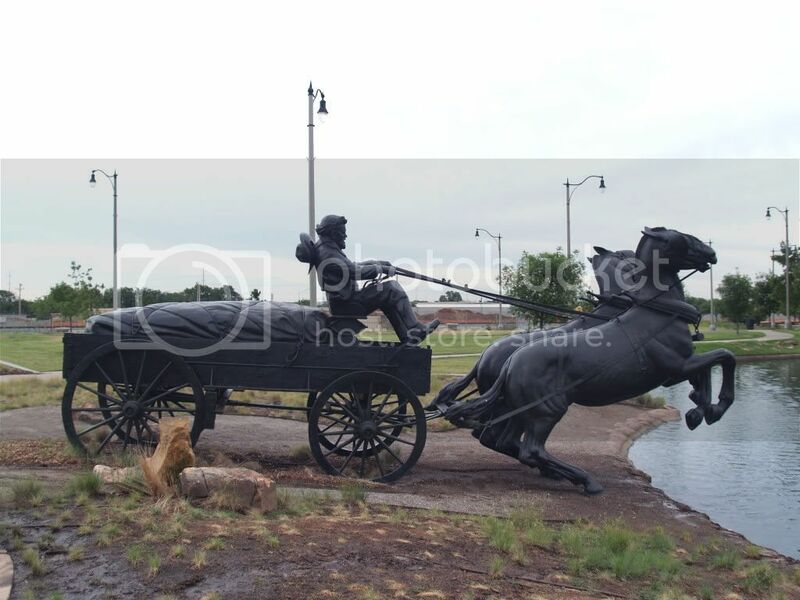 This magnificent work of art, honoring the genesis of our city's history, should not remain obscure. 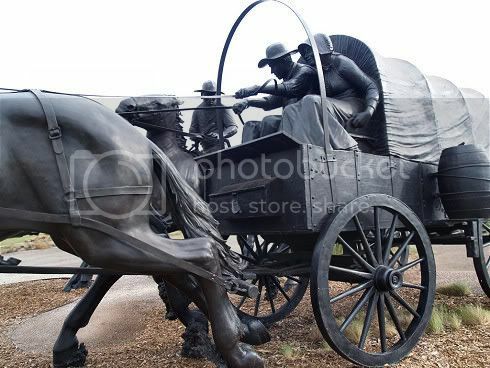 It should be splashed upon every passers-by and local face! It shows what Oklahoma City dreams were made of on April 22, 1889.